I tried quite a lot ToDo or Multitasking Programs. But none of them was really satisfying. Some programs didn’t have some basic functions or other had too much functionality and features, so it was to complicated or user unfriendly. I don’t need a To Do Program with hundreds of features, I just need a program, which is handy, very easy to use and flexible. After month of search for the right tool, with no success, I found Minitask . A little tool, based on Adobe AIR, minimalistisc but so effective. The task manager does everything what I need, except online synchronization or synching between two computer, for example with the help of Dropbox, so I can have my task immediately on my laptop. But I’m sure, this kind of feature will be available in a future version of Minitask . What features has Minitask to offer? 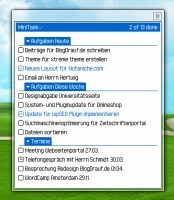 Minitask is a lightweight program, very easy to use and handle. Minitask works with Windows, Mac OS and Linux, you just have to download the free Adobe AIR, which you probably already known or you will need it in the near future for some neat Tools on your computer, like for Font Picker, the ultimative tool to find the perfect font for your design project. 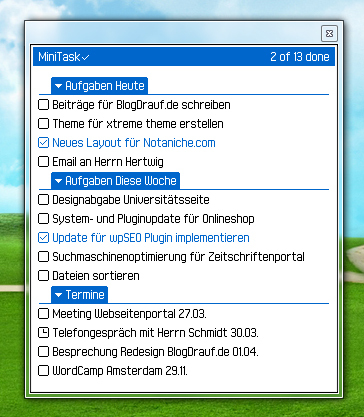 I’m very happy with Minitask, I don’t need an overloaded program like Remember The Milk, Toodledo or whatever. What do you think about Minitask , check it out and let us know your opinion!